The Mets came out on top in a make-up game yesterday, and the Yanks took 2 of 3 from Boston over the weekend. The Mets were looking to take a series win on Saturday after beating the Padres in the first two of four meetings last week; San Diego had other plans in mind, and made them known with a two-out RBI single against Jennry Mejia in the bottom of the first inning. Daniel Murphy tied the score with an RBI single of his own in the third, but Mejia would leave the game in the following inning with tightness in his elbow. David Aardsma took over after Mejia’s departure, but quickly gave up a trio of runs to put New York down 4-1. Ike Davis drove in the second Mets run in the fifth, which unfortunately also proved their last. A lack of offensive production was coupled by a stressed bullpen’s inability to hold down the Padres, and the Mets eventually fell 8-2. Marlon Byrd got the team started on the right path in Sunday’s close to the series with an RBI double in the top of the first. Wilmer Flores added a second run in the fourth inning with a sacrifice fly to put the Mets ahead 2-0; the run proved vital as Matt Harvey gave up 2 runs in the fifth to tie the game. Andrew Brown gave Harvey another lead before he left in the seventh inning, but he was denied yet another decision when Germen gave up the tying run in the eighth. The Mets failed to pull ahead again and Pedro Feliciano allowed Will Venable to knock a walk-off homer out of the park to beat New York 4-3 as San Diego tied the series 2-2. 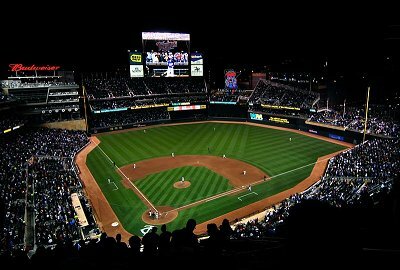 Before returning to Citi Field for a 9 game home stand, the Mets stopped off in Minnesota for a make-up game yesterday. Andre Brown had another productive day by giving the team an early lead on an RBI single in the first inning. Eric Young followed suit in the second, and Omar Quintanilla and Murphy gave Gee a more comfortable lead to work with when they both drove in runs in the fourth to put New York up 4-0. Flores scored a fifth Mets run in the seventh inning, which helped to keep the spread at 4 after the Twins mustered an unearned run in the bottom frame. Marlon Byrd flashed a little muscle in the top of the ninth when he hit his 20th homerun of the season to give the Mets a 6-1 victory. Dillon Gee, who the team needed to pitch a long game in order to rest a weary bullpen, went seven and two-thirds innings, striking out 9 as he improved to 9-8 on the year. The team will host a brief series against the Braves beginning at 7:10 PM, with the second game starting at 1:10 PM tomorrow. After pummeling the Red Sox 10-3 on Friday, the Yankees’ offense failed to compensate for a rare less-than-stellar performance by Hiroki Kuroda on Saturday. Following three and a half innings of scoreless ball, Boston found its way onto the board when a Lyle Overbay throwing error allowed David Ortiz to score in the bottom of the fourth. The Red Sox earned their next two runs in that same inning with a pair of RBI singles to go ahead 3-0. Ichiro Suzuki cut the deficit down to 2 with a groundout that scored Overbay in the fifth, but Boston hit Kuroda for another run in the sixth inning. A second unearned run soon followed on a throwing error by Robinson Cano, and David Ortiz homered in the seventh to put the Red Sox up 6-1. That score held and the series was tied at one apiece. Boston got off to a hot start in Sunday’s rubber game when Jonny Gomes and Jarrod Saltalamacchia hit CC Sabathia for two runs in the bottom of the first, but the tide began to turn when Ryan Dempster went out of his way to hit Alex Rodriguez with a pitch in the second inning. After throwing a ball behind Rodriguez, Dempster tossed two more closely inside and a fourth—which was blatantly meant to hit the controversial third baseman—caught A-Rod on the left elbow and midsection. Instead of ejecting the pitcher, home plate umpire Brian O'Nora issued warnings to both benches, prompting Joe Girardi to argue with him and in turn get ejected from the game. Even without their manager, the Yankees still rallied around Rodriguez as a Curtis Granderson double was followed by an Eduardo Nunez RBI single and Overbay sac. fly to tie the game 2-2. Rodriguez exacted a measure of revenge in the third inning when his groundout scored the go-ahead run, but David Ortiz did the same to tie the game in bottom frame. Sabathia gave up two more runs on a sac. fly and homer in the fourth, and issued a bases-loaded walk in the fifth inning to put the Red Sox ahead 6-3. A-Rod found justice against Dempster when he hit his second homerun since returning from injury to lead off the sixth inning. His homer was just the start of a rally which continued with singles by Nunez and Overbay, and a 4-pitch walk to catcher Chris Stewart. Nunez was forced to leave the game with a tight hamstring, bringing in Jayson Nix as a pinch runner, however the inning did not end before Brett Gardner cleared the bases with a deep-hit triple to put New York back on top 7-6. Mark Reynolds, who played a key part in Friday’s victory, pinch hit for Overbay in the seventh and drove Granderson home on a single, and Stewart added to the lead with an RBI single in the top of the ninth. Ahead by 3, Mariano Rivera came on to collect his 36th save of the year, helping the Yankees to a 9-6 victory and CC Sabathia to his 11th win this season as New York took the series 2-1 over Boston. The Yanks had the night off yesterday, but will play a doubleheader against the Blue Jays at 1:05 PM and 7:05 PM today. The series continues at 7:05 PM tomorrow, and finishes at 1:05 PM on Thursday. TOP TEAM CHARACTERISTICS....TO PUT YOU OVER THE TOP! Subject: LongIsland.com - Your Name sent you Article details of "The Mets Win in Minnesota; Yankees Rally Around A-Rod"